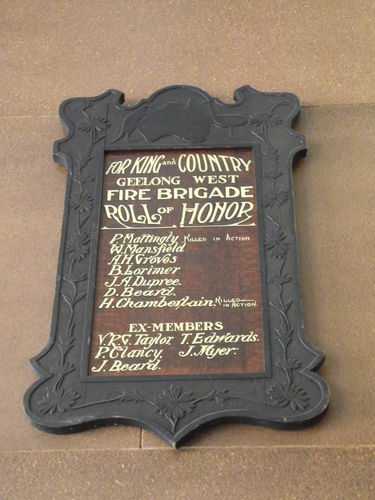 The Honour Roll commemorates members and former members of the Fire Brigade who served in World War One. The roll was originally unveiled in 1915 and additional names were added at a later date. The roll was carved by Fireman W. Harvey. An Honor Board, containing the names of Geelong West firemen who have enlisted, is to be unveiled in the borough brigade station on Monday night by the Mayor, Cr. W. G. Maddon. Invitations to be present have been extended to the borough councillors and the fathers of the following members. Those names appear on the board:—P. Mattingly. W. J. Mansfield, A. H. Groves, B. Lorimer, G. R. V. Taylor and P. Clancy. Geelong Advertiser (Vic), 4 December 1915.